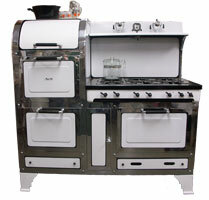 Buckeye Appliance ~ Vintage Stoves! Click here to take a look at some of the many stoves currently in the showroom! 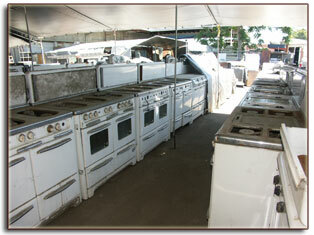 Buckeye Appliance has a wide range of refurbished antique stoves in the store. They range in price from about $1,200 to $10,000, depending on the rarity of the stove and the amount of restoration involved. Most stoves are in the $1,200 - $3,500 price range. 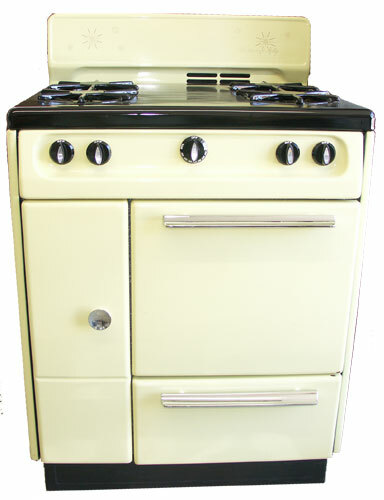 All stoves are refurbished to like-new condition and guaranteed! 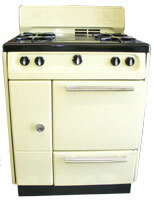 We have a good selection of stoves - finished and unfinished. You'll often find stoves like these (above) that are currently works in progress. This is a Wedgewood from the 1950's, with 4 burners, griddle, oven, and broiler. It has a chrome top and storage compartment. It measures 36" wide, 47" tall, and 29" deep. This yellow Wedgewood Holly is from the late 1950's. It has 4 burners, an oven, broiler and storage. 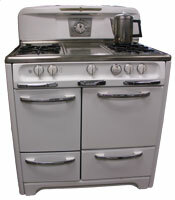 It measures 29" wide, 28" deep, 44" tall..
See a sampling of the rest of the stoves in our showroom! We may not have these exact items in stock. Please visit our showroom, or contact us to find out about our latest collection. Note: We cannot give appraisal quotations over the telephone or via e-mail. 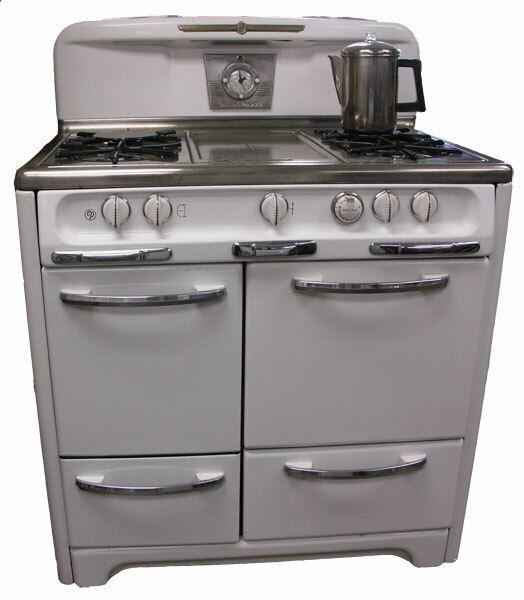 In order to give you an accurate valuation of your stove, we need to see it . Quotes are available on-site for $75.00. Please call or e-mail for details.